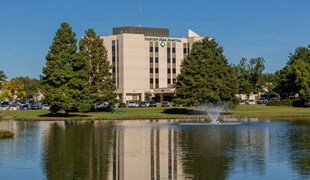 Fairview Park Hospital is a leader in healthcare for the City of Dublin, Laurens County, and the surrounding communities. Fairview Park is a state-of-the-art, 190-bed acute care facility providing community healthcare services including a 24-hr Emergency Room, inpatient and outpatient surgery options, and rehabilitation therapy services. In addition, Fairview provides specialty services through facilities such as the Sleep Center at Fairview Park, the Same Day Surgery Center, the Heart Center at Fairview Park, and the Women’s Imaging Center. Fairview Park has 700 full and part-time employees as well as 105 active and consulting medical staff. Fairview Park is also accredited by the Joint Commission on Accreditation of Healthcare Organizations. As a vital member of the community, Fairview Park Hospital maintains a high level of involvement and health education by performing health fairs and no-cost screenings for common medical conditions. Fairview Park encourages employee participation in health fundraisers, sponsors many local health events on an annual basis, and is dedicated to providing quality healthcare for all of Middle Georgia.